Social magazine app Flipboard for iOS has been dealt a very healthy update today, with the marquee feature being the ability for users to create their very own, personalized digital magazines. Never shying away from beauty, Flipboard has long since been in a league of its own when it comes to ease-of-use and interface, and this rather significant update only cements its reputation as the best in the digital magazine business. As well as being able to edit your own magazine, which you can either share or keep locked away for private reading, there are a host of practical UI alterations, rendering navigation just that little bit better. For the most part, the world’s favorite digital mag looks and feels like the same, slick app which has proven so popular hitherto. But much work has been done to take it to the next level. For example, in spite of its immense popularity, monetization of Flipboard is a bit more of a battle. Ads have been running for over two-and-a-half years, but the new Etsy integration brought about in version 2.0 opens the door to new opportunities. The company will get a cut of every Etsy sale made through the app, and at a rate higher than the standard rate for affiliates. As a long-time user and fan of Flipboard, I am pleased to see its continued progress. As with many apps, it’s one best enjoyed on a tablet, but that’s not to say it doesn’t run nicely on a smartphone either, because it really does. At this point in time, these great new features are only applicable to the iOS version, although we do expect the Android iteration to be updated accordingly in due course. We’ll be sure to let you know if and when that Android version does surface, but in the meantime, you can grab Flipboard 2.0 either by hitting the link below, or by running a search for the app via App Store on your iOS device. Do let us know in the comments what you make of this new update. 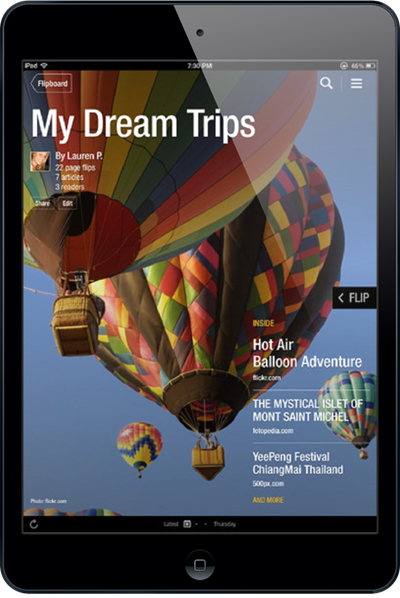 Will you be creating your very-own personalized magazines to share with everyone else?